A historic colliery site might not be the most obvious place to find stunning movie costumes worn by stars including Johnny Depp, Keira Knightley, Sir Laurence Olivier and Cate Blanchett, but here at Woodhorn we like to offer something a little different. Our current special exhibition Dressing the Stars celebrates British costume design and features 40 stunning costumes from 65 years of movie history. 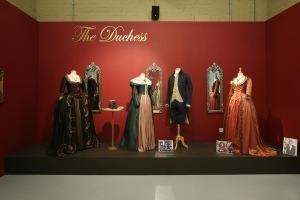 The exhibition takes you on a journey through the decades of award-winning British costume design. The earliest piece is the costume worn by Sir Laurence Olivier in the 1948 production of Hamlet, and the most contemporary pieces include costumes from Pirates of the Caribbean, The Kings Speech and The Duchess. Whilst we are very familiar with the stars and directors of the featured films, the costume designers remain relatively unknown. Yet for each costume on display the designer received a BAFTA or Academy Award (Oscar) or nomination. Alongside each costume there is insightful information about the designer and design process, and even a few anecdotes from the stars themselves. Dressing the Stars is a rare opportunity to view these exquisite and iconic costumes, and to get as close to the stars as most of us are ever likely to! The exhibition is curated by Yvonne Hellin-Hobbs, a former Wardrobe Mistress who worked in the film and television industry for 25 years. Yvonne’s passion for costume led her to develop and produce Dressing the Stars, with the aim of increasing recognition for the role and work of British costume designers. With a network of industry contacts and colleagues Yvonne was able to arrange these special costume loans from a combination of private collectors and major costume houses. Through bringing large scale touring exhibitions to Northumberland, Woodhorn is able to offer our communities the chance to see and experience exhibitions of national and international significance right on the doorstep. But as ever with the fantastic things right on our doorsteps, it’s easy to miss out, so plan your visit to Woodhorn before the exhibition closes on Sunday 9th June! The exhibition runs until Sunday 9 June. On Saturday 8th June we are delighted to welcome Captain Jack Sparrow himself to Woodhorn as part of the Northumberland Miners’ Picnic. Admission charge: Adult- £3.95, Concession- £3.50, Children- £2.95, Family ticket (2+2)- £12.50.